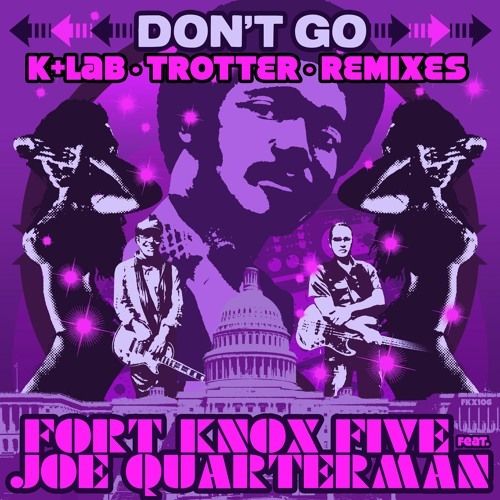 "Don't Go ft. Joe Quarterman Remixes" by Fort Knox Five http://www.fortknoxfive.com FKX106 - Fort Knox Recordings Worldwide Release Date: Friday Jan 27th, 2017 Beatport Release Date: Friday Jan 13th, 2017 Available here: https://www.beatport.com/release/dont-go-remixes/1920571 https://fortknox.bandcamp.com/album/dont-go-remixes Getting the chance to record in the studio with soul legend Sir Joe Quarterman was one of the highlights of the year for Fort Knox Five, and the track Don't Go became an instant funk classic. As soon as the single was released, we heard from some of our close friends who were eager to rework the track and we are proud to present these two fine remixes from K+Lab and Trotter. First up is New Zealand's own K+Lab, who brings live synths and keys to the forefront on his glitched out funky bass remix. The original vocals and horns are layered on top of his beefed up beats and heavy bass stabs. This remix takes the soul of the original and injects it with a heavy dose of modern glitched out funk transforming it into a dancefloor scorcher. Not to be outdone is Trotter, our man in Sao Paulo, who strips out the original's retro funk feel replacing it with a swinging future funk vibe. Bouncing and bubbling synth lines run throughout the remix, dominating the track to create a modern P-Funk groove. Trotter's remix shows his versatile production skills by tweaking the old school flavor of the original track and bringing it into the new millennium. Fort Knox Recordings is stoked to start the new year with a bang, enlisting two fantastic artists who delivered their debut Fort Knox Five remixes on this single. These remixes take the track in two distinct directions; glitch-hop and future funk, however they both follow Sir Joe's advice, “Step back three times, aww turn it around!” Instrumental version of both tracks are also available, making this a must have for funk DJs across the globe.